Anthony Knockaert says he will work hard to get back into Brighton & Hove Albion's Premier League starting line-up again after impressing in Saturday's FA Cup win against Derby. Knockaert scored the opener in Albion's 2-1 win as they reached the quarter-finals for the second successive season. The French winger has not started a Premier League game since the middle of December and although frustrated with the lack of recent game time, Knockaert said he will knuckle down and do his best when called upon. He said: "It's always frustrating. There is not any player in the world who would love to be on the bench but it's football. "It is not only me on the bench, in every club there are quality players. You take the case of (Riyad) Mahrez at Manchester City for example, he's a quality player but hasn't played more than 30 minutes in 2019. "You have to keep working and show the manager you will never give up and wait for your chance. "I'm always going to keep working hard in the league or in the cup. I had the chance to play today and I showed it. "It's always important to me no matter how many minutes I have to try my best but it's easier when you start a game as you're full of confidence. "You have more minutes to show what you can do. When I come on to a game the last 20, the last ten, it's always harder but I'll still work hard and keep trying to be a professional and help my team mates." 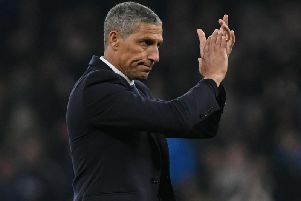 Knockaert admitted he had spoken to Seagulls boss Chris Hughton about the situation and said: "I've had a few chats with the gaffer. I will try to keep professional as much as I can. It's not easy. It's always frustrating but I'm still young and still have a lot of games to play in my career. "I put things into perspective and try to keep smiling. I don't know how many games I will play until the end of my career from now but it will still be a lot. "I'll keep working hard. As soon as he gives me my chance, I will try to keep helping the team. "With the past I've had, I just think there is worse things in life. The most important thing to me is my family. "As long as they are healthy, for me football is after. I'm not saying I don't care about football, I care a lot, it's my job and my life but I just try to wake up every day like this and say if I keep working hard, good things will come. "That's all life is about." Knockaert celebrated with a heart shape celebration towards four-year-old son, Ilyan, after his goal and said: "My little boy was in the stands today. It was a great moment for me and my family. I was really delighted for him to see I scored. "When I left this morning, he asked me to score." Reflecting on the win over Derby to reach the quarter-finals, Knockaert said: "The most important was to get through. In the cup that's all that matters and we did it. "We're into the quarters and now we need to put that to bed and focus on the league again. "We've lost a few points in the last few games and now the most important thing is still the league, so we'll get back and focus on that and be ready for Leicester."